PGM XII.201—269 describes the process of consecrating a special ring of power, “useful for every magical operation and for success”, which it claims is constantly sought after by kings and other types of rulers. In a sense, this particular ring can act as a general phylactery or protective charm against spirits in magical works and conjurations as well as a charm for success, victory, and fortune in all of one’s endeavors. The consecration involves a burnt sacrifice while reciting a hymn praising and calling upon the powers of an almighty god, interpreted here as the Agathos Daimōn. Though the ritual itself is not named and has no attribution, given its similarity to the Ring of Solomon of later magical literature and the use of the name Abrasax, I’ve entitled this ritual that of the Royal Ring of Abrasax. Though the core of the ritual process is present in this part of the PGM, I’ve expanded on it slightly for clarity and offered an alternative for parts of the ritual that some may find inappropriate for their own practices. Additionally, slight changes to the wording of the prayers have been made from the usual translation for flow and style. For those who are unable to read barbarous names or words of power in Greek script, an index of such names is given at the end of this page. …engrave on it a snake in a cirlce with its tail in its mouth, and also in the middle of the circle formed by the snake Selene having two stars on the two horns, and above these, Helios, beside whom ΑΒΡΑΣΑΞ should be inscribed; and on the opposite side of the stone from this inscription, the same name ΑΒΡΑΣΑΞ, and around the border you will write the great and holy and omnicompetent spell, the name ΙΑΩ ΣΑΒΑΩΘ. “Air-colored” in this instance likely refers to a jasper that is light blue, grey, or otherwise cloudy resembling the colors which can be found in the sky naturally. However, most jaspers tend to be dark or in inappropriate colors, so if desired, a similarly-colored and relatively opaque or obscured agate stone may also be used. Once the stone is engraved, it is to be set in a ring of gold, and consecrated according to the following ritual. However, the author of PGM XII.201—269 says that a gold ring engraved and consecrated in the same way is equally effective and good. This would take the form of a signet ring, where the top flat portion of the ring is engraved with the appropriate design and with the name ΙΑΩ ΣΑΒΑΩΘ ΑΒΡΑΣΑΞ engraved on the inside of the ring. 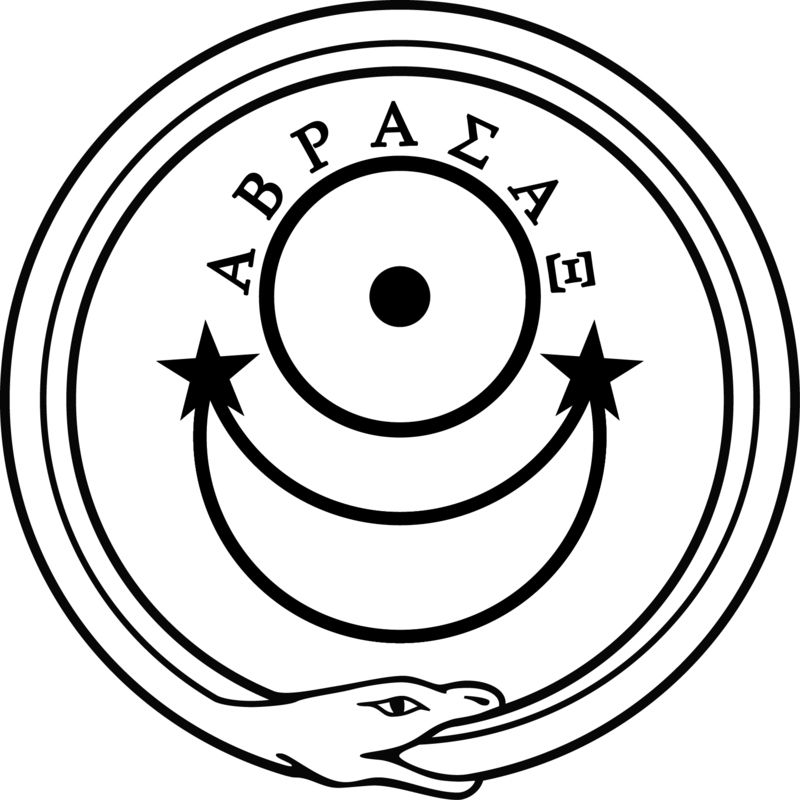 Once the ring is finished, either with or without the stone, and then consecrated according to the ritual given below, the ring should be worn whenever the aid of Abrasax is needed, though one must also be in a state of purity to obtain such a blessing so as to succeed in any matter one might desire. Though which finger the ring is to be worn on is not specified, the text does call it “a little ring”, perhaps indicating that it should be worn on the little finger (pinky), which would also fall in line with later practices involving Solomonic and other magical rings. Frankincense, benzoin, styrax, dragon’s blood, mastic, cinnamon, and so forth are all good choices, but any and all pleasant-smelling incenses will work. Avoid bitter, harsh, earthy, or noxious smells. Aim for at least three types of incense, but the more the better. There are no instructions for timing given in PGM XII.201—269. However, a related section from PGM XIII.734—1077 with a similar consecration ritual for a similar ritual object gives a timing of when the Moon is rising in the East, aspecting (but most preferably conjunct) Venus or Jupiter (better still when the benefic being aspected is in its own domicile and also rising in the East) and free of aspect from Mars and Saturn. More on this and other connections with PGM XIII.734—1077 are described below. Besides that, it would be best to perform the ritual at sunrise, the weather should be good and clear, with few to no clouds in the sky, with little or no wind blowing. This ritual, like many others in the PGM, requires the use of animal sacrifice for the consecration. The text calls for one all-white goose with no blemishes or flecks of color, along with three roosters and three pigeons. Though unspecified, it may be assumed that either all the animals should be male, or the goose and roosters should be male and the pigeons female. Though it might be ideal for all the animals to be pure white, only the goose needs to be so pure; the roosters and pigeons may be of other colors. The animals should be in good health and free of illness, injury, and deformity. Each animal should be washed by dusting or gently scrubbing with natron, then, standing at the west of the altar facing the east, the animal is to be bled upon the altar and into the pit around the altar from the neck using the knife. No order is specified, though the order given of the animals above (goose, roosters, pigeons) can be used, or another order may be considered (such as rooster-pigeon-rooster-goose-pigeon-rooster-pigeon). After each animal has been bled out and the animal has ceased moving, the animal is to be placed upon the altar; this is to be done for all seven birds. No parts of the animals are to be removed, eaten, or used for any purpose once they have been sacrificed. The goose should be placed in the middle of the altar, with the roosters and pigeons alternating around the goose; I recommend the roosters arranged in an upwards-pointing triangle and the pigeons arranged in a downwards-pointing triangle. Once the sacrifice has been made, “all sorts of incense” should be sprinkled on top of the birds on the altar and under and around the altar with the kindling. A fire should then be set under the altar to consume the incense, blood, and flesh as a whole burnt offering. For those who are unskilled or unwilling to perform animal sacrifice in this manner, an alternate approach is available using edible representative stand-ins for the animals: sacrificial cakes. Goose Cake: mix fine, bleached white flour with egg white, milk, salt, and natron. Form it into a large ball or goose-shaped cake. Be sure that it remains as white and pure as possible. Rooster Cakes: mix unbleached flour with whole eggs, milk, and rose water. Form them into three medium-sized balls or rooster-shaped cakes, slightly smaller than the goose cake. Pigeon Cakes: mix unbleached flour with egg whites, water, and honey. Form them into three balls or pigeon-shaped cakes, slightly smaller than the rooster cakes. It is best if the eggs used for the cakes come from their respective species, such as using white goose eggs laid by a white goose for the goose cake, but normal white chicken eggs will suffice for all three types. The eggs for each cake should be thoroughly beaten and aerated, especially when only egg whites are called for. The cakes should be lighter rather than dense, and should be only gently cooked (if at all) so that they become soft and hold their shape but do not brown or change color, especially the goose cake. Once prepared, the cakes should be kept clean and dry until the ceremony. Before the ceremony, each cake should have a small amount of clean water sprinkled onto it, then an incision made across the surface of it using the knife above the altar. After this, the cakes should be placed on top of the altar in the same way as the animals themselves would be. Once each cake is placed on the altar, place the incense on and around the altar, then set a fire under the altar to consume it all. Whether one sacrifices real birds or cake-representations of them, the phrase “Agathos Daimōn, accept this offering!” should be proclaimed as the cut is being made; if actual birds are being sacrificed, the name ΙΑΩ ΣΑΒΑΩΘ ΑΒΡΑΣΑΞ should be chanted repeatedly while they are being bled. Once the sacrifice is made and the smoke has started to rise in quantity from the sacrificial pit, the libation of “wine, honey, milk, and saffron” is to be made into the pit, both around and in the fire (though not so much at once as to put out the sacrificial fire). In the large white bowl, pour in the milk, then mix in the honey and saffron well until it achieves a pale, golden, creamy color. At this point, pour in the wine and gently mix into the bowl. With the bowl in the left hand and the Royal Ring of Abrasax in the right, stand to the west of the pit facing the east. Hold the ring above the pit in the smoke as it rises, and pour in the libation. While pouring in the libation, recite the following three prayers. O gods circling in the middle region of the cosmos, all from one Womb! O vigilants in the many necessities of immortals and mortals! come, benevolent, for this for which I call upon you as kindly assistants in this rite for my benefit! who is always alike, who came forth from the Abyss! I am ΧΡΑΤΗΣ who came forth from the eye of the Sun! I am the god whom no one sees or names in vain! I am the sacred bird, Phoenix! I am Kratēs the holy, called ΜΑΡΜΑΥΩΘ! I am Hēlios who showed forth light! I am Aphroditē, called ΤΥΦΙ! I am the holy sender of winds! I am Kronos who showed forth light! I am the Mother of the Gods, called Heaven! I am Osiris, called Water! I am Isis, called Dew! I am ΗΣΕΝΕΦΥΣ, called Spring! I am the image resembling the true images! I am ΣΟΥΧΟΣ, who appears as a crocodile! I beseech you, come as my helpers, for I call now on the hidden and ineffable Name, the Forefather of gods, Lord of all watching over all! Come to me from the four winds, o God, ruler of all, who have breathed spirits into men for life, master of good things in the world! Hear me, o Lord, whose hidden name is unutterable to all but me: ΒΑΡΒΑΡΕΙΧ ΑΡΣΕΜΦΕΜΦΡΩΘΟΥ! Hearing it, all daimones are terrified! Hearing it, the Sun, Moon, and Earth all roll over! Hearing it, Hadēs itself is shaken! Hearing it, the rivers and seas and lakes and springs become frozen! Hearing it, rocks and boulders are split! Heaven is your head, Aether your body, Earth your feet, Ocean the water around you, o Agathos Daimōn! You are Lord, the begetter, nourisher, and increaser of all! Who molded the forms of the beasts of the Zodiac? Who was the begetter of fruits? Who commanded the winds to hold to their annual tasks? What Aiōn nourishing an Aiōn rules the Aiōns? You are the begetter of all and assign souls to all and control all, o King of the Aiōns, before whom tremble all mountains, plains, springs, streams of river, valleys of earth, seas, oceans, spirits, and all things that are! Even high, shining Heaven itself trembles before you, o Lord, ruler of all, holy one, master of all! By your power the elements exist and all things come into being: the paths of the Sun and the Moon, of Night and of Dawn, all things in Air and Earth and Water and the breath of Fire! Yours is the eternal processional way of Heaven, in which your seven-lettered Name is established for the harmony of the seven sounds of the planets which sing according to the 28 forms of the Moon! Yours are the beneficent influences of the stars, daimones, fortunes, and fates! You give wealth, good old age, good children, strength, food! who have Truth that never lies! Hear me and complete for me this operation so that I may wear this power in every place, in every time, without being smitten or afflicted, so as to be preserved intact from every danger while I wear this power. Yea, Lord, o the God in Heaven, to you all things are subject, and none of the daimones or spirits will or can oppose me, for I have called on your great name for this consecration! Consecrate and empower this object for me, for the entire and glorious time of my life! Given that not many barbarous names and words of power are used in the above, an index of such names and words are provided below instead of a transliterated copy of the above prayer, along with supplemental analysis of the names and words used, if needed. Could be a rendition of the Egyptian “Chrat”, referring to the child Horus (Harpocrates), but Betz says that this word should actually read ΣΟΚΡΑΤΗΣ, or Sokratēs; this can make sense, given how many philosophers of old were later attributed divine powers or status alongside famous religious prophets or other heroes. However, Khratēs (and the later Kratēs, no aspiration on the first letter) make more sense as Horus given the connection to the Sun and to the ubiquitous wadjet symbol. This epithet may correspond to Egyptian Triphis or “Ta Repyt”, the Lady. This name may correpond to either “Isis the Beautiful” or “Isis-Nephthys”. This name corresponds to the Egyptian crocodile god Sobek. The usual Jewish name found for God, Adonai Tzabaoth, “my Lord of Hosts”. The name here, according to Betz, corresponds to the Egyptian epithet “the great one of earth”. Come to me, you from the four winds, ruler of all, who breathed spirit into men for life, whose is the hidden and unspeakable name, unutterable by human mouth, at whose name even the daimones are terrified when they hear it! You whose is the Sun, ΑΡΝΕΒΟΥΑΤ ΒΟΛΛΟΧ ΒΑΡΒΑΡΙΧ ΒΑΡΒΑΡΙΧ ΒΑΑΛΣΑΜΗΝ ΠΤΙΔΑΙΟΥ ΑΡΝΕΒΟΥΑΤ and the Moon ΑΡΣΕΝΠΕΝΠΡΩΟΥΘ ΒΑΡΒΑΡΑΙΩΝΕ ΟΣΡΑΡ ΜΕΜΨΕΧΕΙ—they are unwearied eyes shining in the pupils of men’s eyes—of whom heaven is the head, ether the body, earth the feet, and environment the water, the Agathos Daimōn! I call on you, the greatest god in Heaven, strong lord, mighty ΙΑΩ ΟΥΩ ΙΩ ΑΙΩ ΟΥΩ, the Being! Perfect for me, Lord, the great lord, unutterable magical sign, so that I may have it and remain free of danger and unconquered and undefeated, I who am NN. Try to prepare this when the Moon is in the East and in conjunction with a beneficent planet, either Zeus or Aphroditē, and when no maleficent one, Kronos or Arēs, is in aspect. You may do it best when one of the three beneficent planets is in its own house, while the Moon is taking the position of conjunction or aspect or diametrical opposition and when the planet, too, is in the East, for then the rite will be effectual for you. Accordingly, do not idly talk about the way to annul it, if you don’t want to help to damage yourself, but keep it to yourself. The “spell to annul” to be engraved on the back of the lamella: ΠΑΙΘ ΦΘΑ ΦΟΩΖΑ. 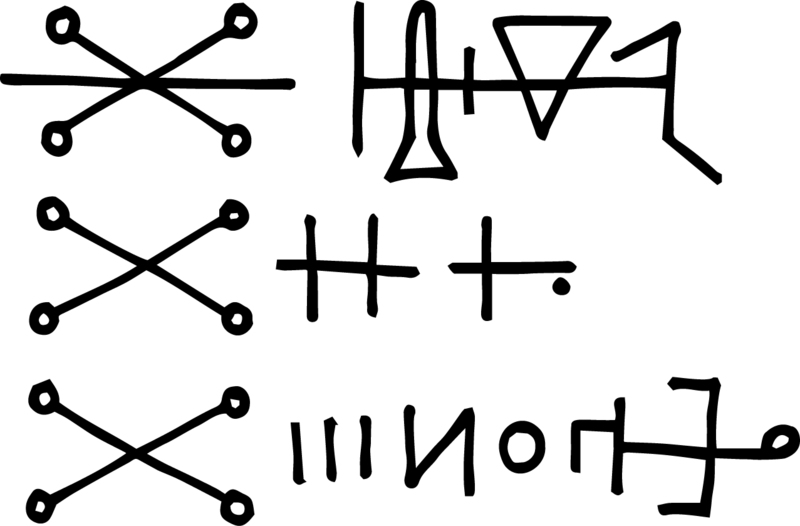 The “spell to annul”, transcribed as PAITH PHTHA PHOŌZA, can partially be translated as “Ptah, health”. A handful of other rituals that tie into the use of this charm follow the consecration given in PGM XIII, but these are incomplete and corrupted. Though the ritual given in the Tenth Book of Moses from PGM XIII above is clearly a different ritual with a different sacred object, there are many similarities: the use of a libation of wine and milk, the use of incense and other fragrant woods and substances, the insistence on purity, the use of inscribing something on both the back and front of a metal object with a special stone, a focus on the importance of the direction of East, and so forth. However, this part of the Tenth Book of Moses also gives timing and astrological instructions which may also be applied to the consecration of the Royal Ring of Abrasax.